This application enables Lockheed Martin Prepar3D to provide a scenery screen for PSX; a special motion data transfer technique makes the scenery movement extremely smooth. This (commercial) package includes five modules: FSX/P3D scenery generator bridge, FSX/P3D traffic injection, aloft weather injection, additional ground service features, and hardware printer interface. This program enables Microsoft FSX (and Lockheed Martin Prepar3D) to serve as a scenery generator for PSX. It also enables PSX to be used in an online ATC environment such as the VATSIM network. XView is a scenery generator for PSX based on X-Plane by Laminar Research. It also enables animation of the external parts of the aircraft and integration of weather and traffic. This Java program connects PSX to Cesium, a global 3D scenery generator similar to Google Earth, but Cesium's imagery and terrain database are open-source. This Java program is a comprehensive simulation of the 744 CMC with many detailed test and monitoring functions (not supposed to replace professional CMC training tools; consider it a concept demonstrator). This is a web based scheduling and flight planning system with many features and options. Plans can be created with minimal effort and realistically applied in flight. BACARS simulates BA's company specific ACARS. It also provides features not related to ACARS, such as additional pushback controls, SATCOM etc. BACARS runs on Windows. This (commercial) Java application injects real-world traffic data live from the Internet into PSX. The injected traffic will be detected by PSX's TCAS and will also appear on the windshield. Realshear provides additional controls for the design of more complex windshear scenarios. It also includes analysis graphs, and programmed scripts that run historic real-world windshear scenarios. FiFli, short for "first officer and flight attendant", provides additional automatic crew actions, calls, and announcements in various languages, triggered by flight phase changes and certain switch positions. Work in progress. Already available are some situation files and a new PNF voice that uses standard Boeing checklists instead of airline specific lists. This extended and updated package now includes 320 aircraft models of 38 airlines. The PSX Router is a network component for PSX. It offers enhanced monitoring and robustness features. A connection hub for PSX and addons designed for complex simulator environments. If you know what the Router is, it can perform a similar role, but also includes a text chat client and other additional features. AdaptPSX can, among other things, relay data between serial ports and PSX, e.g. send GPS NMEA data to serial ports, output flightdeck printer data to real printers, or interface PSX with the Aerosoft MCP. This app allows you to control the CDUs of PSX from an Apple iPad. This application allows you to control the CDUs of PSX from an Android-based computer tablet. This (commercial) Java application transfers data from PSX to ForeFlight (an iPad app for pilots). This Windows program interfaces VRinsight's MCP2 hardware with PSX. This Windows program generates motion cues for 6 degrees of freedom Stewart type motion platforms. This interface reads all kinds of vibration related variables from PSX and drives vibration hardware like buttkickers, bass shakers, and other types of sound transducers. This Java program connects the VRinsight CDU2 hardware with the left CDU in PSX. ELVis, the Easy Layout Visualizer, shows your layouts in the context of the whole PSX cockpit, so that you will get a better overview of what is where. Select the airline options you want; a list will show you on which aircraft models the options are installed. Flight deck hardware and interfaces compatible with PSX. A line of products that allow interfacing external inputs and outputs with PSX. 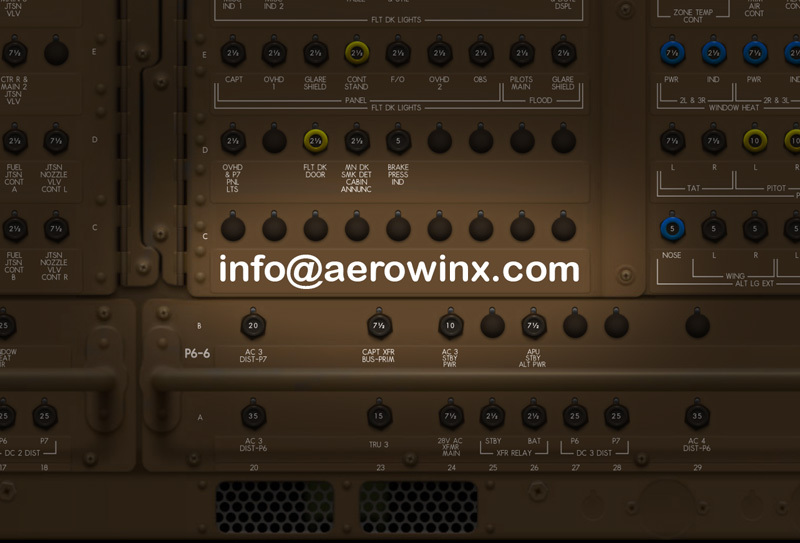 Provides PSX with external EFIS control panels and various MCP models. Modular circuit boards enabling the integration of real aircraft panels and aftermarket panels with PSX.